Hint: There's more to it than just walking like a "regular person." You wouldn't think you'd need help figuring out how to walk. It's simple. Put one foot in front of the other. Steppy Pants remixes the entire concept of walking in a very odd way, but that's the fun of it! 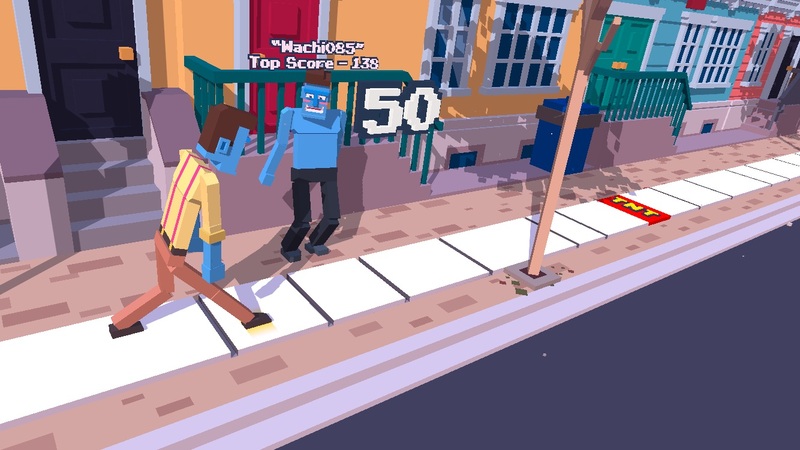 A bizarre cross between QWOP and Crossy Road, it's all about creating an addictive blend of physics-based gameplay that keeps you coming back. But beware that you'll need a little advice now and then. That's why we're here with some tips to make sure you're getting the highest score possible! Steppy Pants is all about taking baby steps, and that's with both feet. You're not just controlling one entity, but two different legs. This means when you're taking control of both legs you can assume a comfortable rhythm, back and forth with each leg. When you don't have to think as much about what you're doing you'll find that you're actually able to accomplish twice as many steps. Just don't stop to think about what you're doing, because you'll break your concentration. Steppy Pants is not a game about thinking. It's about doing. And you need to make sure you're stepping with style. If it helps, think of a song you can step along to and listen to it to keep the rhythm. You'd be surprised what you can accomplish by simply introducing some kind of distraction into the mix. Like I said before, Steppy Pants is all about baby steps. As much as you might like for it to be about "adult steps," it's just not. Some parts of the sidewalk are too large to be digested in one huge leap, so conquer them one little bit at a time. If you try and take over huge sidewalk chunks at a time, your character is going to end up falling, and it's game over. Focus on gaining ground a little bit at a time and you'll be in much better shape than if you stuck to your original strategy of gaining ground as much as you can at one time. Your main goal in Steppy Pants should be to string as many combos together as possible, and this is done by gaining segments of sidewalk. If you can get across several segments of the sidewalk in time, you'll pull off a combo. You'll start seeing colored lines on the sidewalk where a combo is possible. If you can put together three at a time you'll get more points than if you just did three combos at different times. It's all about not biting off more than you can chew. In this way it's possible for you to score big, but you can't get cocky. That's a surefire way to spell out your demise when it comes to the world of Steppy Pants.